Marine Grade Polymer (MGP) is a durable, high-density polyethylene. It does not rot, warp or swell, fade or degrade. You may be thinking about how it must be bad for the environment as it sounds quite ‘plastic’, well, actually, it can be recycled and is environmentally friendly. Why is Marine Grade Polymer good for outdoor furniture? Since it doesn’t break down when it’s exposed to water, sunshine or humidity, Marine Grade polymer is the perfect material to exposed outdoor furniture. It’s even suitable for saltwater exposure. Furthermore, Marine Grade Polymer is so strong that it can even withstand strong winds, unlike many other materials for outdoor furniture. Adirondack Collection – with this collection you’re spoilt for choice. Not only can you choose the material color and style, but you can also choose the color of the Marine Grade Polymer too. There are 6 different color polymers for you to choose from. Belle Isle – the Belle Isle sets mix seating materials with aluminum as well as Marine Grade Polymer. Again, you have heaps of choice! Since you can choose the frame color, the polymer color and the cushion color, you really will have a tough time deciding. There are thousands of color and style combinations! 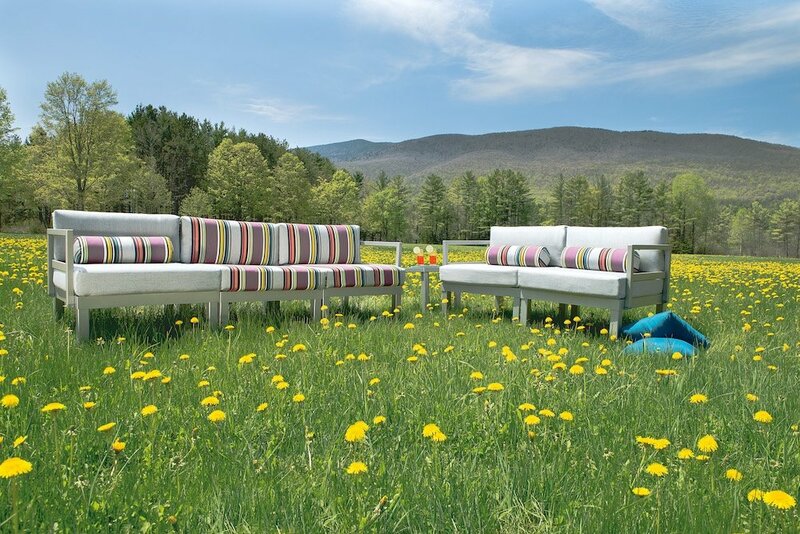 Leeward – the Leeward designs use large-scale furniture frames. There are over 100 different fabric colors and styles! St. Catherine – this is a traditional style but with a modern twist. The backs of the seats are tall and curve for both design and comfort. You still have the great same choice of color options.